CRPF is the largest police force in central armed police forces of India. 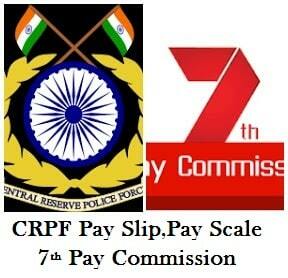 In the 7th pay commission set in this financial year has declared the pay scale for the CRPF officers recently. According to the pay commission this year the pay scale for all the officers has increased immensely. However the hike in salary does not show up as much as other Government sectors do. Being the largest police force the officers are getting much lower salary than other Government employees. According to a survey that took place recently that CRPF is the only sector which has been grew sharply over the last 6-7 years. However the salary or pay scale didn’t grow as per the growth of the sector. CRPF has 15 ranks in its department. These ranks are DG, SDG, ADG, IG, DIG, Commandant, second-in commandant, deputy commandant, assistant commandant, Subedar Major, inspector, sub inspector, assistant sub inspector, head constable and lastly constable. The 7th pay commission has declared salry hike for all these ranks in the current financial year. As mentioned there are 15 ranks in the CRPF department and here we will discuss the pay scale for each rank. Constable: Constable is the lowest rank in CRPF. Previously constables were getting salary up to 20,200/- which has now reached to 60,600/-. Head Constable: HC is the second lowest rank in CRPF. Till last year the pay band for the HC were 5,200 to 20,200/- but now from this year onwards it will be 15,600 to 60,600/-. Assistant sub-inspector: senior to head constable, assistant sub-inspectors were falling under the same pay scale like constable and HC. Like these two ranks assistant sub-inspectors are also expected to get paid up to 60,600/-. Sub-inspector: The pay scale for the sub-inspectors has increased to 1, 04, 400/- to 34, 800/-. The lower limit of the pay scale has also hiked from 9, 300/- to 27, 900/-. Inspector: Inspectors, like sub-inspectors also had pay band of 9,300 – 34,800/- which has tripled like others and reaches to 27,900 – 1, 04, 400/-. Subedar Major: Same hike as Inspector, Subedar Major will also get up to 1, 04,400/- from the current financial year. Assistant Commandant: Assistant Commandants had pay band 15,600 – 39,100/- which has now become 46,800 – 1, 17,300/-. Deputy Commandant: Like assistant commandants, DCs will also get a pay band of 46,800/- to 1, 17,300/-. Second-in Commandant: Second-in Commandant, one of the high positions in CRPF who used to have pay scale around 39,100/- will now be able to draw 1, 17,300/- this year onwards. Commandant: Commandants are of course senior to the above mentioned commandants. These officers are special and fall under high pay scale. A commandant who used to have drawn up to 67,000/- salary which has become 2, 01,100/-. DIG: Deputy Inspector General who used to get paid up to 67,000/- is now drawing salary of Rs. 2, 01,000/- per month. IG: Inspector General Officers will now be living under the pay band of 1, 12,000/- to 2, 01,000/- which was as low as 37,400 – 67,000/-. ADG: Additional Director General is one of the top police officers of the nation. Now a ADG will get up to 2, 25,000/- which was hiked from 79,000/-. SDG: the second top position in the CRPF of India, Special Director General will fall under the pay band of Rs. 2, 25,00 to Rs. 2, 30,000 that is raised from 75,500/- to 80,00/- pay band. DG: Finally the top position in CRPF, i.e., Director General whose salary is fixed at 2, 50,000/-. Previously it was 80,000/- which was also fixed. All these are the old and new pay bands that the 7th pay commission has declared for the different ranks in CRPF. The new pay scale are the proposed scale and expected to materialise from this year. The pay scale of the police officers under CRPF is expected to increase three times in this current fiscal year. It was proposed by the 7th pay commission, 2016. Now another issue that CRPF officers face while viewing their pay slip. It is not a simple task to get a pay slip for a CRPF officer. There are few steps that can lead you to the page from where you can see and download your pay slip online. Step1: Visit the CRPF official website where you will get an employee login tab in the right side of the page. Step2: Click on the link that says employee login and enter your login details such as username and password. Step3: again in the home page of CRPF find and click on the link in the right side of the screen that says view pay. Step4: the website will ask you to enter your login details just after clicking on the link view pay. Your user name is the CRPF / IRLA number that was given to you when you are being recruited. Enter that number in the place of username and enter your birthday in the form of ddmmyyyy (without any space or sign) in the place of the password and click on the ok button. Step5: once you click on the OK button or press the Enter key on your keyboard you will be directed to your payment and salary details’ page where you can find your pay slip. Step6: by default you will be directed to the current pay slip page. You can find any month’s pay slip by entering the month there and can view your pay slip. Step7: you will get two options to save the document, download and the other one is print. You can download the document and keep the copy in your computer or you can directly print form the website and get a hard copy of your pay slip. These are the few steps that will help you to view and download your pay slip from CRPF website. Additionally when you log in to the website and enter your portal you will get other news like payment tracking system, pension related issues and other IT related news. There is another method that helps you to view and download your payslip is via sharepoint. Sharepoint is a way to get such documents. There is a direct link available at sharepoint through which you can directly reach the pay slip page and can easily download or print the required document. Sharepoint works smoothly in internet explorer browser.